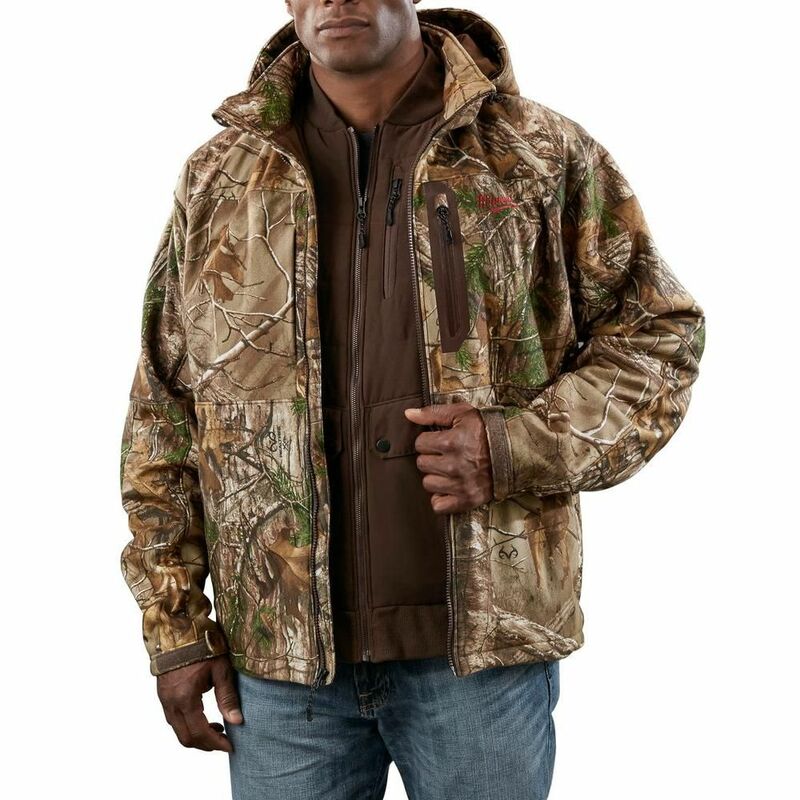 M12 Cordless Realtree Xtra Camo 3-in-1 Heated Jacket Only - L Milwaukee<sup></sup> M12 Realtree Xtra<sup></sup> Camo 3-in-1 Heated Jacket: The first customizable heated jacket system designed for the outdoorsman, the Milwaukee<sup></sup> M12 Cordless Realtree Xtra<sup></sup> Camo 3-in-1 Heated Jacket sets a new standard in cold-weather performance and versatility. Worn separately as a base layer or attached to the outer shell and zip-off hood, the heated vest integrates (5) carbon fiber heating elements and advanced fabric-layering technology to distribute and maintain heat across core body areas. The rugged wind and water resistant shell features special noise-reducing fabric with the Realtree Xtra<sup></sup> Camo pattern. Made out of the same weather-resistant material, a removable hood helps keep heat in and provides additional protection against the elements when added to the shell. Powered by M12 REDLITHIUM Batteries, It also includes a fuel gauge to check your battery life and built-in USB port for charging portable electronic devices. All pieces are washer and dryer safe. M12 Cordless Realtree Xtra Camo 3-in-1 Heated Jacket Only - L is rated 4.0 out of 5 by 2. Rated 4 out of 5 by JB from Great quality product. The vest is completely separate from the jacket, so I would have preferred... Great quality product. The vest is completely separate from the jacket, so I would have preferred that the vest zip into the jacket so you could put them on and take them off as one piece rather than two, but that is my only complaint. has to be really cold and windy out before you even need the heated feature. Rated 4 out of 5 by Anonymous from Hunting jacket I purchased this to use while hunting, performed well although the run time was only a couple hours on high setting w/standard battery. I didn't use the XC battery because I didn't want it poking me in the back while sitting in my deer stand. I realize Milwaukee is a tool mfg. and these were probably designed with active workers in mind, however I suggest they make the camo version geared more toward hunters who will likely be less active, by adding more insulation in the arms. Also the battery pocket is not easy to reach while sitting in a deer stand, maybe add the ability to route the power cable into a front pocket if desired. Overall I'm satisfied with it and would recommend the purchase to others.